I am pleased to meet so many friends, old and new, in the city of Belgrade for the Third Meeting of Heads of Government of China and Central and Eastern European countries (CEECs). The New Year is just half a month away. Let me first extend, on behalf of the Chinese government and people, our New Year greetings and best wishes to you, my colleagues, and through you, to the people of CEECs. I also wish to thank Prime Minister Vučić and the Serbian government for your excellent preparation and thoughtful arrangements made for this meeting. In 2013, we had a successful meeting and released the Bucharest Guidelines for Cooperation. The past year witnessed growing political mutual trust and frequent high-level exchanges between our two sides. I have had very good discussions, either in Beijing or on other occasions, with many of the leaders present today. Two-way exchanges keep expanding, and our cooperation between youths, different localities, think tanks, media as well as in education are more active than ever before. China and seven CEECs celebrated the 65th anniversary of diplomatic ties, a testimony to our profound traditional friendship. The international political and economic landscape is undergoing profound and complex changes. Countries are faced with the pressing task of working for steady growth, greater employment and structural adjustment. On the other hand, with regional hotspot issues keeping emerging, security and stability are under severe challenges. That said, however, peace and development remain the underlying trend of the time. China will stay committed to the path of peaceful development and to a win-win strategy of opening-up, and will continue to work to uphold global peace and regional security and stability. We are ready to work with CEECs and other countries for the sustained growth, prosperity and stability of the world. China is the world’s largest developing country while Central and Eastern Europe is home to many of Europe’s emerging market economies. Our economies are cut out for each other, hence the great potential for cooperation. By working together in the same direction, we will be able to create huge cohesion and dynamism, which, in turn, will help us withstand the downward pressure, facilitate our growth and achieve industrial upgrading. In this context, I wish to make the following proposals. First, foster new highlights in China-Central and Eastern Europe cooperation. CEECs enjoy a solid economic foundation, rich natural resources endowment and high-level scientific and educational development. 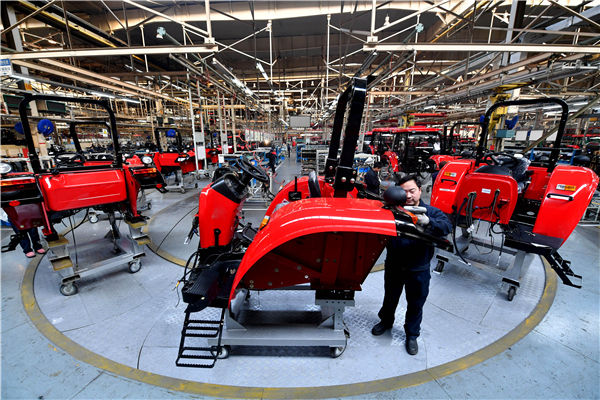 China has a huge market of 1.3 billion people, a well-established industrial system, a full-fledged equipment manufacturing sector in particular, as well as sufficient capital. We are well able to realize mutual complementarity, industrial integration and common development. We will build on what has been achieved under the Bucharest Guidelines, actively implement the Belgrade Guidelines, and start the formulation of the Medium-term Agenda for Cooperation between China and Central and Eastern European Countries on the basis of our respective medium- to long-term domestic development plans and the China-EU 2020 Strategic Agenda for Cooperation. Hence, with focus on infrastructure development and cooperation in production capacity, underpinned by financial cooperation, we will be able to move our cooperation forward while fully accommodating each other’s concerns. Second, build new connectivity corridors. CEECs need more effective investment to fend off the impact of the crisis and more input in public goods to improve people’s wellbeing. This makes infrastructure development a pressing task. The quality ports in CEECs, once connected with rail lines, highways and other transport arteries, will have a major role to play in many fields. For instance, we may develop a new route for coordinated sea-land transportation between China and Europe on the basis of the sea ports and land transport arteries in the Balkans. Such a route will greatly shorten the transport distance between China and Europe and lower the logistics cost of international trade. During my visit, China, Hungary and Serbia reached agreement on the Budapest-Belgrade railway project, under which we will strive to complete building a modern high-speed railway within two years that meets both the EU standards and the needs of all sides. While making efforts to consolidate hardware facilities, we also need to improve our software environment. China is ready to work with CEECs to facilitate customs clearance. And CEECs are welcome to take an active part in China’s initiatives of building the “Silk Road Economic Belt” and the “21st Century Maritime Silk Road”. Third, explore new space for industrial cooperation. Cooperation in infrastructure and major projects are of great significance and will set fine examples for future cooperation. In recent years, China’s technologies in high-speed railway, nuclear power, telecommunications and other equipments have advanced rapidly, and China leads the world in the production capacity for steel, cement, plate glass and other construction materials. For CEECs, to build major projects in transport and IT require more engineering machinery, upgraded equipment and locally-produced raw materials. We enjoy broad prospects in cooperation in this regard. China is ready to build plants in CEECs by utilizing its advanced production capacity and equipment, which will help generate more local jobs. It would also be an effective way of cooperation for us to jointly develop industrial and technological parks. The Central Europe Trade and Logistics Cooperation Zone and Wanhua Industrial Park have now taken shape in Hungary. Bulgaria, the Czech Republic, Croatia, Romania, Serbia, Slovakia, Slovenia and other CEECs have all proposed to build industrial parks. We will actively encourage Chinese companies to take part in this endeavor. We will also expand imports from CEECs and promote the balance of trade through dynamic growth with a view to achieving the target of US$100 billion for two-way trade at an early date. We need to make full use of the mechanism of the China-CEEC Local Leaders’ Meeting and make sure that the localities play a bigger role in our cooperation. Fourth, establish a new framework for investment and financing cooperation. To address the existing investment and financing difficulties in our cooperation, China has decided to establish a China-CEEC framework for investment and financing cooperation, consisting of three major elements: First, we will encourage CEECs to continue to make full use of the US$10 billion special credit line. Considering the actual financial capacity of various countries, we will, in light of specific projects, provide loans with more preferential terms, lower financing costs and increase credit volume as appropriate. Second, we will encourage Chinese companies and financial institutions to take an active part in the PPP and privatization process in CEECs. China will set up a US$3 billion investment fund and facilitate equity investment in countries in the region. Moreover, China will launch the US$1 billion China-CEEC Investment Cooperation Fund (stage two) in support of investment projects in Central and Eastern Europe. Third, China welcomes the issuance of RMB denominated bonds in China by CEEC companies and financial institutions and will work to explore the launch of an RMB fund for investing in Central and Eastern Europe. In this way, we will be able to offer more financing means to projects, thus giving more impetus to China-CEEC cooperation. Fifth, explore new areas of people-to-people exchanges. This year, outbound Chinese tourists have totaled more than 100 million. We need to make good plans for the 2015 Year of China-CEEC Tourism Cooperation and Promotion to encourage and attract more Chinese visitors to the beautiful landscape of Central and Eastern Europe. We need to enhance our exchanges in science, technology, culture, health and between our youths, women and media, and support the establishment of a scholars and think tanks center. We need to expand our exchange in education so as to nurture more globally competitive talents. China will double the number of government scholarships provided for CEEC students. It is also hoped that visa application procedures will continue to be simplified to facilitate people-to-people exchanges. We need to give full play to the role of the Secretariat for Cooperation between China and CEECs and vigorously support the development of cooperation associations and other institutions and platforms, so that our cooperation will be flourishing across the board. Europe, home to the largest number of developed countries, has a major role to play in the global political and economic architecture. China and the EU are now working to build a partnership of peace, growth, reform and civilization. We are natural partners for cooperation as we have no conflict of fundamental interests. China firmly supports a multi-polar world moving toward globalization as well as the process of European integration. We hope to see a more united, prosperous and stable Europe and a strong euro. CEECs make an important part of Europe. China and the 16 countries in the region enjoy a profound traditional friendship, strong political mutual trust and deepening practical cooperation. Our closer cooperation will bring benefits not only to our countries, but also to Europe as a whole, as such cooperation will play an important role in facilitating balanced growth within Europe. As the saying goes, “True gold never loses its color even after repeated smelting; and the same remains true for real friends.” China and CEECs, having been old friends already, are now each other’s new partners of cooperation. Though we are geographically distant, we make each other’s close neighbours in heart. I believe through our joint efforts, China-CEEC cooperation will flourish and enjoy even brighter prospects. China is ready to host the China-CEEC leaders’ meeting in 2015. We will count on your support in this effort, and I am sure that together, we will be able to take China-CEEC cooperation to a new high. I look forward to seeing you again in Beijing next year.